Following the collapse of Teotihuacan, the Toltecs swept down from the north and wiped out the few remaining survivors and took over the Valley of Mexico. They set up a capital in Tula under a ruler named Topiltzin. Then, Tula itself fell to invaders in 1224. The fall of Tula led the way for the Valley of Mexico to be invaded by Nahuatl speaking Chichimecs. They all claimed the honor of Toltec descent The Aztecs or Acolhuas were among the last of the Chichimecs to arrive in the Valley of Mexico Upon arrival, they found it heavily to populated. At that time, there were seven major Nahua tribes living m the area. They had been told by their god Huitzilopochtli to settle where they found an eagle sitting on a nopal cactus eating a snake. They settled on two islands m the western part of Lake Texcoco. Lake Texcoco was part of a five lake system in the Valley of Mexico. 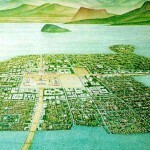 Then sometime around 1300, they began to build the city of Tenochtitlan. By 1427, the Aztecs had achieved supremacy in the Valley of Mexico. 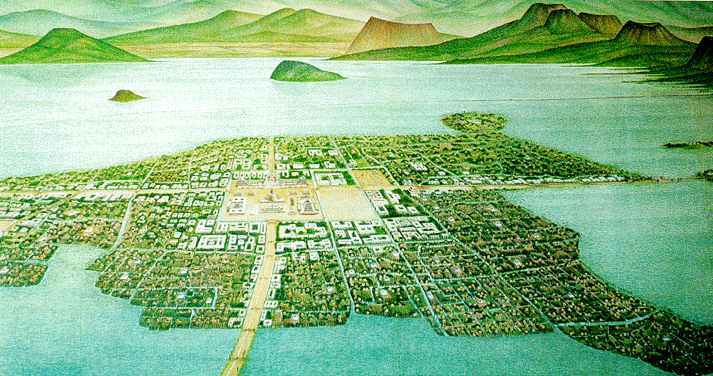 By all accounts, Tenochtitlan was a beautiful city. Its great towers, pyramids, temples, and buildings appeared to rise right out of the water. Three long causeways connecting the city to the mainland were constructed during the reign of Itzcoatl ( 1427-1440). Transportation around the city was done on foot and in canoe. A system of porters (tlamemes) car­ried heavy items. However, canoes were quite effective in carrying heavy or large loads. The Templo Mayor was the tall­est of all of the buildings and the center of the city. This was also where many of the human sacrifices took place. The Aztecs believed that in order to keep the sun rising each day it was necessary to feed the gods human hearts Wars fol­lowed the agricultural cycle, taking place after harvest in October and ending before the rainy season began in May. Wars were not only fought to vanquish the enemy, but more importantly to capture victims of sacrifice to the deities so that the heavens could be kept in balance and the com harvest would continue to be bountiful. The chinampa system of agriculture, which used floating garden beds, grew enough beans, corn, squash, tomatoes, and chili peppers to feed the population that at its peak probably reached 200.000. 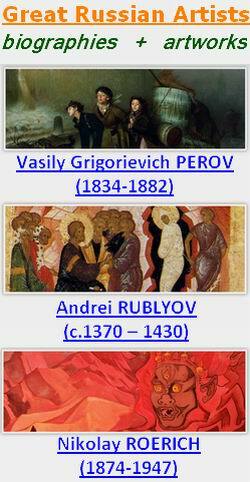 In many ways, the market places were very similar to markets found today. Long distance trade usually involved luxury products like jade, gold, turquoise, amber, quetzal feathers, and exotic animal pelts. Also, available were some fine artisan pieces. The Aztec written language was a mixture of Dicto­graphs, ideograms, and phonetic writings. They enjoyed music, dancing, and poetry. 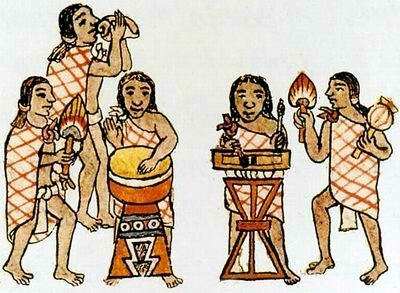 On the eve of the Spanish conquest there were two Aztec classes, the ruling class or nobles (pipiltin) and the common people. The pipiltin were educated in special schools that taught glyph writing. In addition, the ruling class received tribute and exercised political control. They also controlled the agricultural lands m the Valley of Mexico. 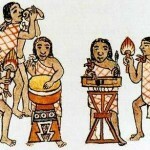 Aztec clothing differed according to social class. Men wore loin clothes that were usually embroidered and a blanket that hung over the left shoulder and was knotted on the right shoulder. Women wore wraparound skirts of white cotton tired with a narrow belt and short sleeve tunics. Both the skirts and tunics were decorated m colorful embroidery. Also, men wore sandals and the women went barefoot. The average Aztec was a vegetarian due to the lade of available meat. Oc­casionally, dog would be served on festive occasions The lords’ diet was entirely different. They feasted on venison, turkey, quail, tomatoes, fish, winged ants, and rats in salsa. Chocolate milk was only for the noble class. 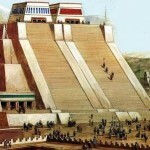 The Aztecs maintained a large class of slaves. Slavery was sometimes assumed by the lower classes m return for food, but it could also be the punishment for not paying their debts or for commiting a variety of other offenses. Slaves were bought and sold at the great market called Atzcapotzalco. They could be purchased for personal service or for sacrifices to the gods. In 1428, a league of cities dominated the Valley of Mexico. This Triple Alliance of Tenochtitlan, Tlatelolco and Tlacopan levied tribute on scores of towns large and small. If a town resisted subordination, then the rate was doubled. Failure to pay tribute was reason enough for the Aztecs to invade. Aztecs left the political structures alone and never undermined the authority of local government if it remained loyal. The expansion of the Aztec empire followed the trade routes. Trade merchants (pochtecas) sometimes worked as spies, preparing the way for the next conquest. 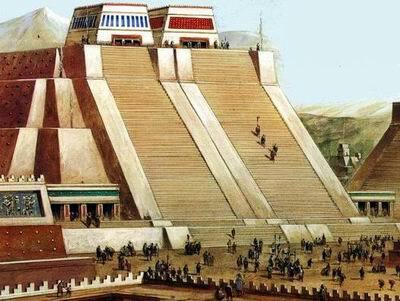 Some historians believed that at their peak, the Aztecs and their allies ruled over as many as 20.000.000 people.